One of the most successful trucks for the long haul operations is the DAF XF 105. In Europe the truck is one of the best sold models and it is highly appreciated for its low maintenance costs and the high fuel efficiency. For these two reasons the vehicle was also named the International Truck of the Year 2007. 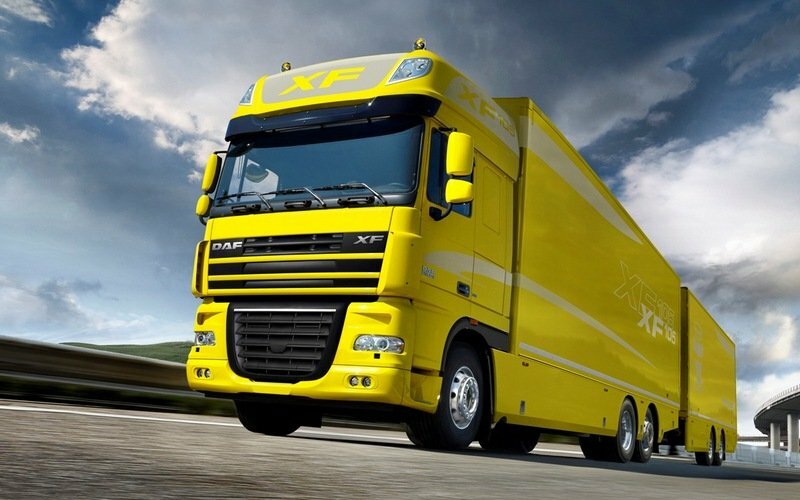 The DAF XF105 competes in the 44 tonnes segment with models like the Renault Magnum, Man TGX or Iveco Stralis. The truck is available with a choice of tractors and rigids with two, three, or four axles and a choice of three engine outputs. The exterior design won’t win any beauty award, as the flat body panels and the lack of any significant design elements gives the truck a plane look which is almost rudimentary. The thin rectangular headlights don’t do any good to the overall picture either, while the round fog lights are too small to have any significant impact on the truck’s design. Inside, there is almost the same story. The wrap round dashboard was kept pretty simple and the overall design was sacrificed for functionality. The XF105 rivals have taken the time to work over their cabins to provide better quality materials as well as dash and center console designs that don’t look or feel like they have 10 years old. The materials are comparable with those from the old generations Iveco Stralis and are inferior to the Volvo FH or even the Man TGX. Despite the rock-hard plastics however, the build quality looks pretty good and the cabin is solidly built. Another good news is that there’s nothing functionally wrong with the equipment. Thanks to the familiar design, all of the controls are intuitive and easy to use without getting lost in a sea of buttons. The two-tone interior with embossed-pattern seats also adds a touch of class to the Super Space Cab. The driver’s seat is ergonomically designed and it’s pretty comfortable thanks to a wide range of adjustments. Moreover, the lateral mirrors cover most of the rear view and compared with other trucks in the segment the blind spots are kept to a minimal level. We also like the instrument cluster which is fitted with classical round gauges that are clear to read. There is also a central information display which presents different essential vehicle information when the driver request. Besides the usual dashboard features, there are three DIN slots, which allow installation of an audio system, a navigation system, camera display or an on-board computer. Other features include Adaptive Cruise Control, Forward Collision Warning and DAF Camera System. Beneath the bunk is space for large storage drawers, with an option for installing a 42-litre refrigerator drawer, in which even large bottles can be stored upright. There is also a standard bottle holder mounted within easy reach of the driver’s seat together with many of other useful lockers. 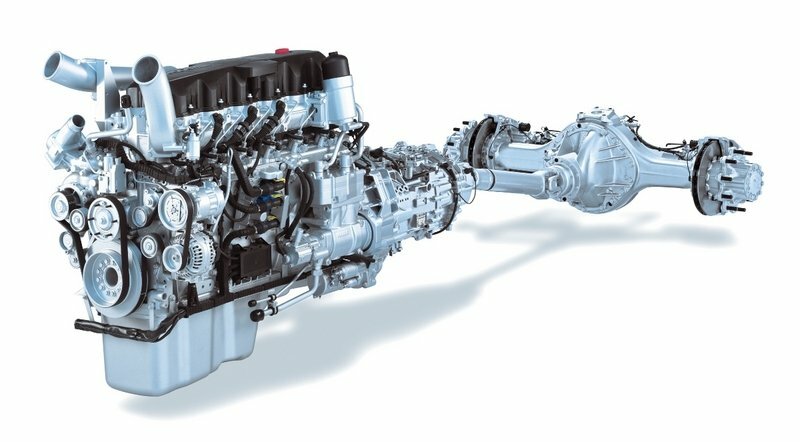 The DAF XF 105 is equipped with a 6 cylinder 12. 9 liter turbocharged engine available in 410, 460 and 510hp outputs in both Euro 4 and Euro 5 versions. All three engines have plenty of torque available and cope well with the heavy duty character of the truck. The engine’s power is kept in leash by the AS tronic ZF 12 speed automatic transmission which offers the possibility to change the gears manually thanks to the steering mounted stalk. 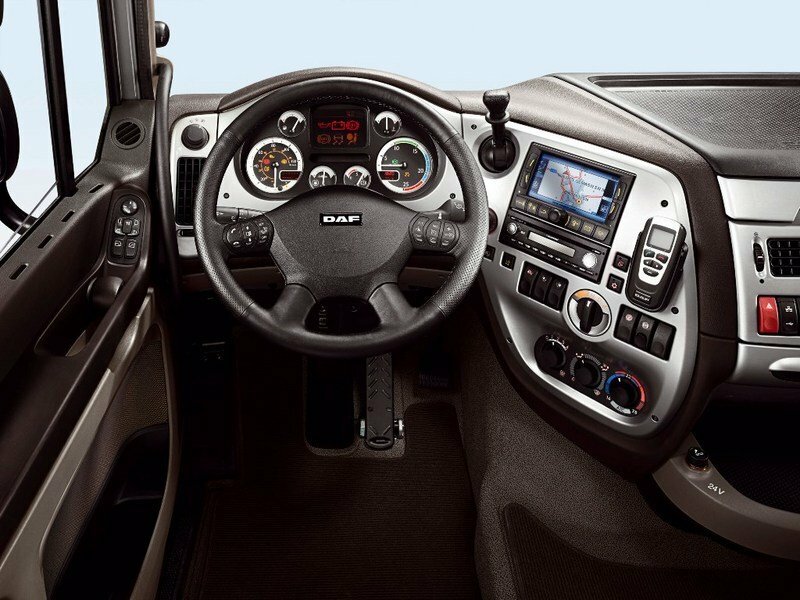 Unlike other gearboxes, the driver can progress the auto mode by changing gears before the truck’s selection. This feature will come in handy when you’ll have to deal with downhill areas or with level acceleration. However, unlike other automatic transmissions in the segment, the AS-Tronic needs manual interventions from time to time, in order to make use of the full engine power with maximum efficiency. Even with the weakest engine the truck never feels underpowered and it’s able to pull its full 44 tones weight without breaking a sweat. The downhill speeds are kept in check by the capable engine brake and the retarder which make a brilliant job in slowing down the truck. The standard brakes are fitted with all around discs and can stop the truck without thinking twice. The handling was also at par with the competitors, as it was on the predictable side. Also, despite the tall cab, there isn’t any accentuated body roll or other issues to spoil a relaxing ride. Moreover, thanks to the all around air suspension, the ride is comfortable and the truck has good cornering abilities, giving you plenty of road feedback. Thanks to its high versatility, the low maintenance costs and the small fuel consumption, the DAF XF105 will continue to remain on top of the sales charts. On the other hand, it’s true that the truck’s design may not be the most beautiful in the segment and the cabin could’ve been better. However, these details are less important when we are talking about the heavy duty segment and the XF compensates with other strong points. Its engines have plenty of punch and are reliable, and even if the automatic transmission it’s not as precise as other units in the segment, it still does its job with dignity.